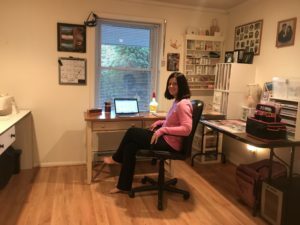 My home office is for more than writing, as you can see from the scrapbooking area to the right and the sewing desk to the left. I do all sorts of creative things in my office, although most of my time here is definitely spent at my writing desk. If I hit my word count goal for the day early enough, I’ll sometimes reward myself with a little crafting time. 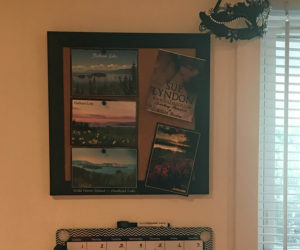 On my cork board, I have some postcards from Montana, one of my favorite places to vacation, especially the Flathead Lake area. To the right of my desk is my treasured Captain Janeway action figure that Mr. Lyndon got me for Christmas many years ago. 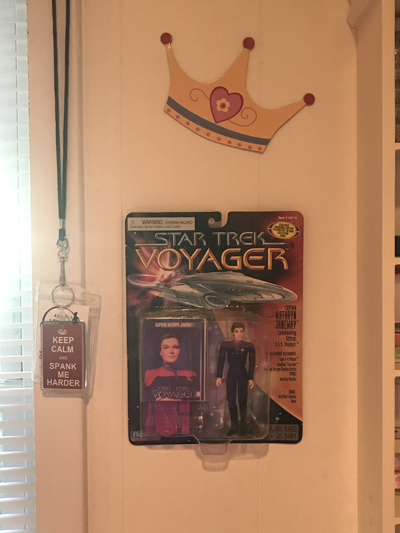 I’m a big Star Trek Voyager fan, and I find Captain Janeway’s character super fascinating, so of course she has a place of honor right next to my desk. I do most of my writing during the day, but I often sneak down to my office to read and crochet in the evenings. 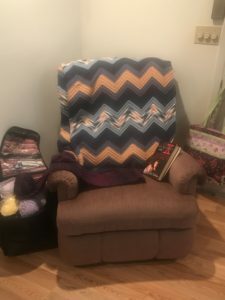 Here is my reading/thinking/crocheting corner. My office is pretty much my favorite place to hang out, whether I’m writing or crafting or reading. 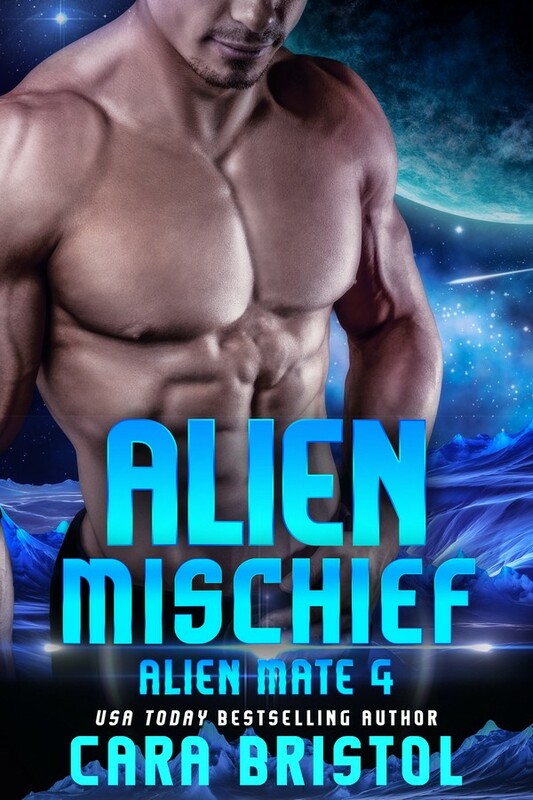 Note: Like all the books in the Barbarian Mates series, Claiming Their Slave can be enjoyed as a standalone title. 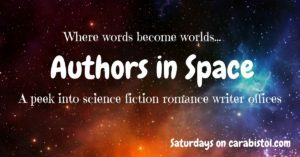 This entry was posted in Guest blogs, Life 101, Romance writing and tagged alien romance, aliens, author offices, Authors in Space, Claiming Their Slave, craft rooms, guest blog, habits of writers, home offices, MFM ménage, science fiction romance, Sue Lyndon, writer offices. Bookmark the permalink. Thanks for contributing! It was so much fun to see your office. I really enjoy this feature, Cara. That’s one tidy office, Ms. Lyndon. I’m impressed! 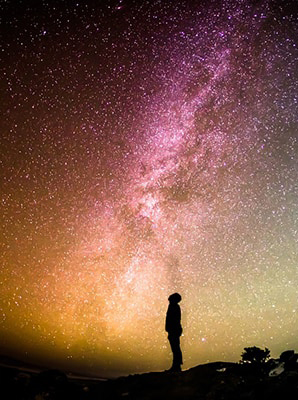 Looks like a great place to create in all different ways. If she’s like the rest of us, she cleaned it up for the picture. Lol. I love seeing author’s writing spaces. What a great feature. Thanks for sharing, Sue! I have an office, but I’ve confiscated the living room for my literary efforts. It is now the strangest looking room in the house. Quite a few authors migrate out of their offices. Otherwise you spend your entire life in one room. Lol. You are so organised though how do you manage that? 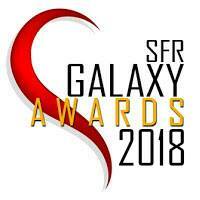 Thanks for allowing us to look inside.